With the popularity of video games, television shows, movies and Internet-based role-playing games, reading has become less and less of a priority for many children. 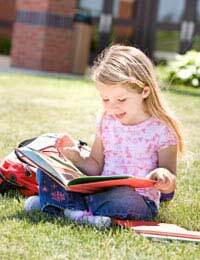 Even youngsters who are literate can easily gravitate toward passive play in lieu of picking up books or magazines. In order to make reading something that your kids will want to do every day of their lives, it's essential to make it fun and rewarding. Obviously, as your child grows, he or she will become "hooked" on reading for reading's sake; but in the beginning, it's up to you to demonstrate how reading can be thrilling and satisfying. Many parents, babysitters and educators erroneously believe they have to come up with complex ways to get the kids in their lives to read. However, that's just not the case. In fact, extremely simple Reading Games can go a long way toward encouraging a child to read on a daily basis. One such game that's typically met with excitement is hide-and-seek with written clues. Take some of your son or daughter's favourite toys and hide them throughout your house or yard. Then, come up with simple written clues that must be followed in order to find the "prizes". Be certain that your clues are challenging but not overwhelming. For instance, if you're playing this game with a five- or six-year-old, don't call the blue chair an "azure-coloured chaise lounge". Just call it "a blue chair", "a blue seat", or "a blue place to sit." Be creative in your descriptions, but don't make your clues so difficult that your youngster looses interest. Should your youngster be reluctant to read to you, suggest that you read a book, article, story, poem or magazine together. Then, trade off - you read one page, he or she reads another. Doing this will allow you to open a dialogue about reading; it will also enable you to teach him or her new words. Many literacy programmes suggest that parents and educators reward children for proficient reading. Though you shouldn't give kids huge sums of money or grandiose playthings, it's not a bad idea to offer them perks directly related to their reading habits. For example, a mum might tell her son that if he reads for thirty minutes every night before bed for a week, he can have a special treat on Saturday. Similarly, a teacher might decide that if all her students spend a certain amount of class time reading, she'll bring in a little game for everyone to play at the end of the week. One word of advice, however - keep the prizes very simple. That way, your child will get into the habit of reading for the right reasons. And a lifetime of literacy and enjoyment will be in his or her future! In the end, stay focused on your goal and try not to become frustrated if your child is reluctant to read. Remember that the best way parents can help their children is by becoming avid readers, too!